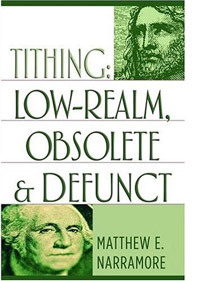 I just finished the book, “Tithing: Low-Realm, Obsolete & Defunct” by Matthew E. Narramore. Overall this was a good and informative book. After you’ve read so many books and heard so many sermons on tithing that you hear so much of the same expository notes. But there were some new insights in this book, as well as some old insights that were said well. What Narramore says about tithing, in that it is low realm obsolete and defunct is in principle saying what pro tithers themselves have been saying but not admitting. What do i mean tithers “say” that tithing is low realm? Well, considering they claim that tithing is for new believers to start at, then i would assume that their opinion is that tithing is low realm for a majority of people. If a majority of people cannot be governed by a tithe, then why make it a stepping stone into the financial courts of stewardship? When tithing was introduced to Israel in the law it wasn’t introduced as a beginner’s course. Abraham had not been born again and spiritually re-created with God’s own divine nature in him. Abraham was not a son of God with the same standing as Jesus Christ in God’s family. Abraham was not the temple of God. God did not dwell in him. Abraham id not have the indwelling Holy Spirit to lead him. Narramore had mentioned more than this, but i thought these were the strongest points. I enjoyed the overall tone of Narramore’s book. It really focused on Spirit-led giving. I guess first of all it broke down tithing and then topped it off in the end with how Spirit-led giving should replace these low-realm, obsolete, and defunct standards of giving. “Sons of God have the nature of their Father. They also share his objectives. They live to accomplish his desires, not something separate of their own. That is why they don’t need laws, rules, and principles of giving. They don’t need a standard of 10 percent because they have already committed 100 Percent. . . They aren’t locked into a mindless routine like tithing because they have the Spirit of God in them who is greater and wiser than any generic system of giving. . . Children and servants cannot live like sons. . . [servants] they have to be told what to do. They have to be regulated and monitored by others. They must have laws to direct them and punishments to reprove them. They must have rewards to motivate them. They haven’t internalized the family objective so they have to be treated as hirelings. “Sons of God have the same relationship to the Father that Jesus has. Since tithing is not part of Jesus’ relationship, now that he has been resurrected, it is not part of their relationship. Since they are one with Jesus, they don’t tithe to him either. They are joint owners of all things together with Christ by their spiritual union. Tithing was ordained for a different kind of relationship with God-not for sons. How can tithing be carnal and immature? Simply because our giving is not governed by the Holy Spirit. Instead it is regulated by the standards of mankind. Think of tithing as a security blanket for the one giving the tithe and the one receiving the tithe. First, as the one giving the tithe, it is easy to appease the conscience once you’ve reached the mark that your peers are all shooting for as well. Second, for the receiver, it is more comfortable to rely on a consistent amount of income. You don’t have to worry about the Spirit calling people to give elsewhere. All you have have to do is make sure they understand that tithing is a minimum requirement and there you have a stable offering to budget from. After all who really lives by faith anyways? 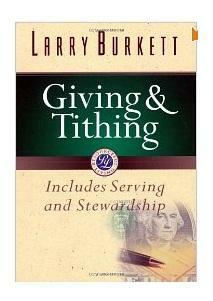 So the book is called, “Tithing: Low Realm, Obsolete, & Defunct”. You can purchase it at the website here. What are your thoughts on Matthew E. Narramore’s book? Usher: So Deak, when will the church stop the tithe? Deacon: When they realize the pastor is simply paying his mortgage and car payment with it and throw him out on his ear. Narramore and Tekoa worked out a deal to offer an online version of the book, linked above. I plan to buy the book anyway, because it is worthwhile. Got great reviews from most folk on Amazon.com Reading those receiving tithes from their congregations was self-evident in one reviewers comments. I like that Usher and Deacon comment above. Way to go! The tithe was food for you and your favorite Levite, even back in the OLDEN TESTAMENT. Check out Deut.12:7 There in the presence of the Lord your God, you and your families SHALL EAT and shall rejoice in everything YOU have put your hand to, because the Lord your God has blessed you. The only thing that bothers me about the churches position on tithing is the “Jesus repellent” is presents to the unbelievers and half-Christians out there. The church today is causing more Christians to stumble and is much more divisive than the religious Christian Jews ever were about wanting the Gentile-Christians to obey the diet laws, and that was a huge problem back then. Tell me, if Jesus came back now, what would he be addressing in our lives today? What issues would he have a problem with in churches? Paul thought Laodicea and Smyrna was bad, but honestly, how do you think the modern church would do against God’s glorious standard? Think about what you’re defending before you pick up your guns. something to think about. If Obedience is said to be better than sacrifice, than being a good steward is better than a sacrificial giver. I agree with these posts. Having said that, under grace, we should give MORE, not less, than the law required under the Old Testament. It is estimated that only 4% tithe, or give at least 10%. Think of that, 96% give LESS than 10% of their incomes to God. The truth is, the main problem with the 10% rule, is that God owns ALL we have. God loves a cheerful, quick to act, extravagant giver. How few of these are in our churches? So many interesting points in this book. The finished work of Jesus Christ…awesome! I had always wondered why God would “curse” me if i didn’t give him a percentage of my money…man, that low-down dirty religious devil. Anyway…God is 100% committed to us so that’s a new standard and way of thinking all together, so, he requires the same for us. I love the story about the religious Pharisee declaring what he had done (works) to get Gods approval, and the sinner who cried out for mercy and went home justified because he saw that he was undone in God’s sight…through Jesus Christ our provision has been supplied 100% and it takes faith…check out Romans 4:16 amp, it’s radical! !